← Spring 2015: Ona’s Flood – join us! 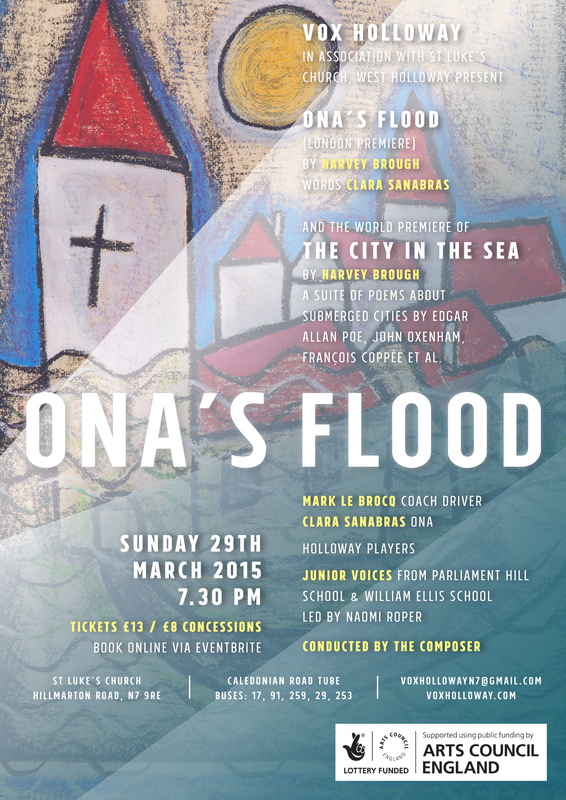 Join us on Sunday 29 March at St Luke’s Holloway for our performance of Ona’s Flood. The London premiere of Harvey Brough’s Ona’s Flood will tell the story of a young girl, Ona, who has a premonition of a modern day flood. The choir will be joined by an instrumental ensemble of 16, including strings, piano organ, timps, percussion, bugles and handbells and youth choirs from Parliament Hill School and William Ellis School. The concert will also feature brand new settings of a suite of poems (by Edgar Allan Poe, John Oxenham, François Coppée and Clara Sanabras) on the theme of Submerged Cities – the world premiere of The City in The Sea. This performance is made possible by lottery funding – public funding by Arts Council England. This entry was posted in Choir, Clara Sanabras, Community choir, Concert, Uncategorized and tagged community choir, Harvey Brough, Holloway, Ona's Flood. Bookmark the permalink.